"Walking into Jack's Wife Freda feels like a big, warm hug. Maya and Dean serve food you want to eat, anytime, any day. Though I'll never stop parking myself at their restaurants, I can't wait to re-create their favorites (and mine) at home. "-Jessica Seinfeld, bestselling author of Deceptively Delicious, The Can't Cook Book, and Food Swings From Jack's Wife Freda, the New York City neighborhood restaurants with a worldwide following, a gorgeously illustrated cookbook filled with beloved recipes for accessible, delicious, and inventive Jewish comfort-food cooking at home. Jack's Wife Freda, a pair of downtown restaurants whose signs bear the illustrated face of their namesake grandma, have become part of the epicenter of Jewish comfort-food dining in New York's Greenwich Village. With their communal, casual vibe and detailed coziness, the restaurants feel like home, and everyone--from the many local regulars to thousands of tourists just passing through--is greeted like family by owners Maya and Dean Jankelowitz, and their staff. And the food is another reason you never want to leave. A tempting and imaginative meld of Jewish immigrant traditions and recipes, the menu crafted by chef Julia Jaksic borrows from the Ashkenazi and Sephardic dishes of the Jankelowitz's respective childhoods, along with the flavors of South African and Israeli cooking. Fans line up on Carmine and Lafayette Streets each morning for a taste of the legendary spicy baked Shakshuka, Eggs Benny with Beet Hollandaise, or Rosewater Waffles with Honey Syrup. The bustling lunch crowd digs into classics like Matzoh Ball Soup, paired with new favorites like Peri-Peri Chicken Wings infused with African bird's eye chili, and Maya's Grain Bowl with Turmeric Tahini Dressing. Refreshing daytime drinks including Cantaloupe Juice and Nana Tea give way to a signature New York Sour at five o'clock, alongside an appetizer of Fried Zucchini Chips with Smoked Paprika Aioli or Haloumi with Grapes. Dinnertime brings delectable crowd-pleasers that home cooks will turn to again and again: Spiced Rack of Lamb with Herbed Israeli Couscous, Duck Tagine, and Freda's Fish Balls. Malva Pudding, Yogurt Panna Cotta with Rose Syrup and more are a perfect end to any meal. Good food enjoyed with friends and family is the foundation of Jack's Wife Freda, and Maya and Dean bring the same vibrant energy and love of great cooking and healthful eating to their first cookbook. 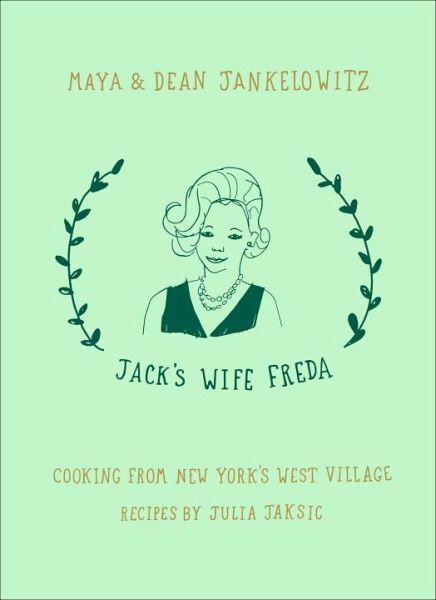 Whether you live around the corner and pop in regularly for a favorite meal or look forward to an out-of-town visit, this beautifully illustrated and user-friendly book makes it easy to eat from Jack's Wife Freda all day, every day. Follow on Instagram @jackswifefreda. Dean and Maya Jankelowitz are the co-owners of Jack's Wife Freda, the wildly popular pair of identically named restaurants in New York City's Greenwich Village and Soho neighborhoods. They have two children and live in downtown Manhattan. Julia Jaksic attended Le Cordon Bleu in Chicago. She cooked at several restaurants there, before moving to Manhattan to work with Missy Robins at the SoHo Grand Hotel. She became Chef of Employees Only in 2006, where she is currently Executive Chef and consultant. She works as a consultant on various restaurants in New York City, Brooklyn, and with the Jack's Wife Freda restaurants in SoHo and the West Village. Jaksic specializes in fresh, simple flavors and slow food cooking. She learned butchering from her father, who worked in New York's Meatpacking District in the 1970s, and is producing a documentary inspired by her childhood in butcher shops about the production of food in America. Jaksic lives in New York and Nashville, Tennessee.